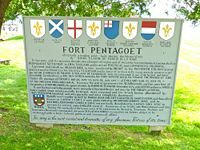 Fort Pentagoet (1635-1734) - Established in 1635 as a French colonial fort on the site of previous settlements at the edge of French Acadia. 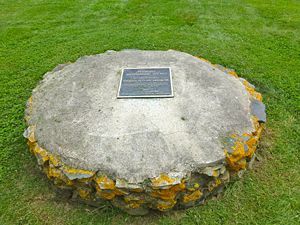 Captured by the British in 1654 and named Fort Penobscot (1) . Returned to the French by treaty in 1670. Retaken by the British in 1688 and again returned by treaty. Seized in 1722 by the British who destroyed the Fort and subsequently abandoned the site as a fortification in 1734. Also known as Fort Castine (3). Markers and some archeological relics. At the site and on the grounds of Our Lady of Hope Catholic Church in Castine. 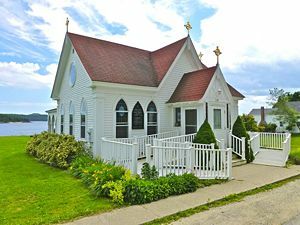 Location: Our Lady of Hope Catholic Church at 131 Perkins St., Castine, Hancock County, Maine.